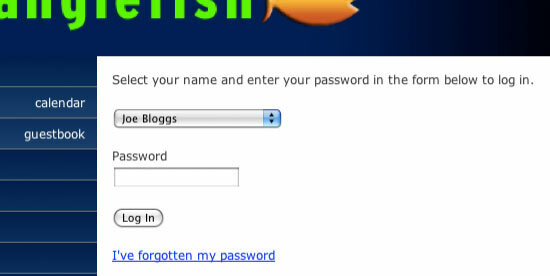 You edit your Spanglefish 2.0 website by using its password-protected on-line editing system. You can edit the text, change the images, add new pages, edit the order of pages on the menu, edit the title of each page, set up a guestbook, etc. Start by ‘pointing’ your web browser at your web site which will have a web address like . .
You 'log in' to your site editing system by going to your site's Home page and clicking on the 'Login' tab at the top left of the page, or by adding 'login.asp' at the end of your site's address and clicking the 'enter' key on your keyboard. Now a 'Site Admin Login' field will appear where you can enter your password. Select your user name from the drop down (there may be more than one if you share admin responsibility with someone else), enter your password, and click on the 'Log In' button. Once logged in, the site reloads, revealing a tabbed control panel across the top of your site window . . . This Control Panel features tabs for various editing options, including . . .